The Elate Eight continues with an intriguing match-up between Margaret of Scotland and Enmegahbowh. One of the sub-plots of this round has been “What will Celebrity Blogger Heidi Shott possibly come up with for Enmegahbowh kitsch?” This will be answered today as these two pillars of the faith vie for the third spot in the Faithful Four. Yesterday, Dietrich Bonhoeffer punched his ticket to the next round by ousting Jerome 74% to 26% and joining Mary Magdalene in keeping their Golden Halo hopes alive. To make it this far, Margaret defeated William Temple and John Cassian while Enmegahbowh beat Thomas and David Oakerhater. Check out the updated bracket to see what’s coming up in Lent Madness. Meanwhile, back at Lent Madness HQ, Tim and Scott plot to launch an entire line of saintly kitsch. Kitsch-meisters? You bet! Speaking of which, check out our recent post Kitsch Cranks (which really should have been spelled “Kranks”) and read about Lent Madness in the Huffington Post. 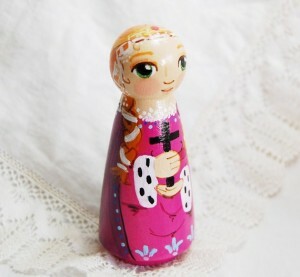 If she’s a queen, there must be a doll, right? And indeed there are several dolls one can purchase for your saintly queen doll collection. First, there’s this wooden peg doll, made to order, featuring the blonde queen (she was Saxon after all) holding a black cross and wearing a tartan sash (“not historically accurate but cute all the same”). 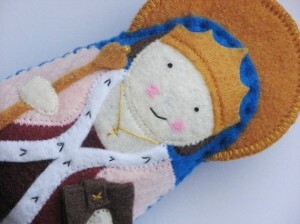 Or, if a wooden doll doesn’t seem cuddly enough, here’s a whimsical Margaret of Scotland Felt Saint Softie. This Margaret is holding her special book of Gospels that miraculously did not show any water damage after being dropped into a river and she is also wearing a special prayer on her back. I personally am planning to buy one of these! 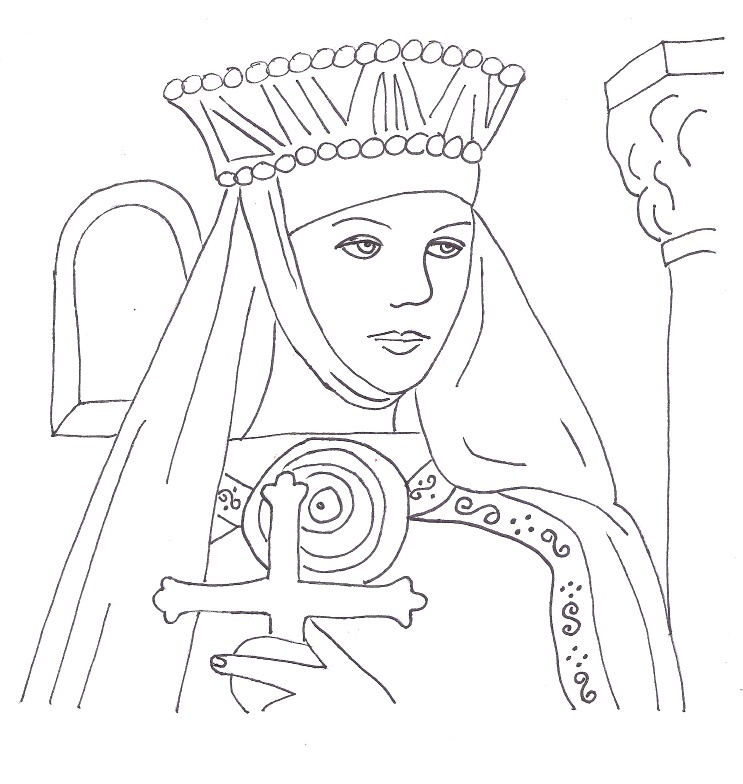 Want to color your own St. Margaret? Download this coloring page and experiment with different queenly shades for her outfit and fingernails! 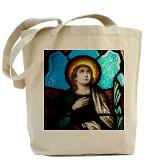 Or get a St. Margaret tote bag to carry all your St. Margaret stuff around with you. The same design is featured on a keepsake box to keep all your St. Margaret stuff safely at home. 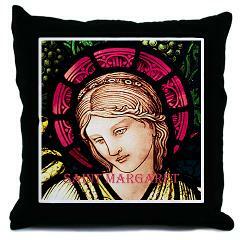 Speaking of home, if your taste runs more to home furnishings than dolls and coloring pages, here’s a St. Margaret throw pillow for your sofa or favorite chair so that you can read your morning p rayers and devotional books with the saint by your side. The same design can be ordered on a coffee mug, ornament, or keepsake box. Finally, while you’re out and about (visiting the St. Margaret Pub in Twickenham, say), show your Team Margaret pride and solidarity while wearing this great Team Margaret Hoodie and make everyone guess why there’s a shamrock on the front. 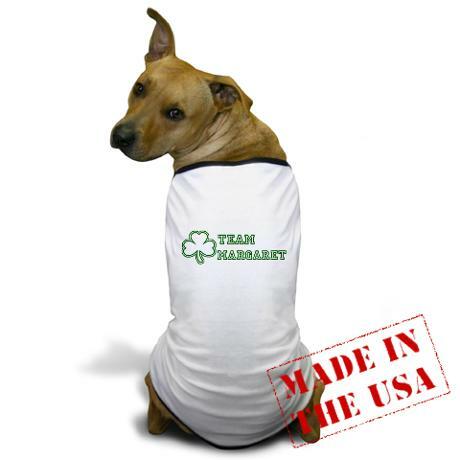 Pair this with the Team Margaret doggie shirt for your canine companion for the ultimate in kitschy Margaret-wear! As predicted by a member of the SEC, commercial kitsch featuring Enmegahbowh, the first Native American to be ordained as an Episcopal priest, is scarce. In fact here’s a screenshot of an early attempt to turn up any product that would even begin to rival yesterday’s St. Jerome/Lion Reversible Doll. Enter the fans! Team E supporter Mary-Elise Haug offered an assist by sending along a Not For Sale (and one-of-a-kind, we suspect) item honoring the “Providential Man” himself. 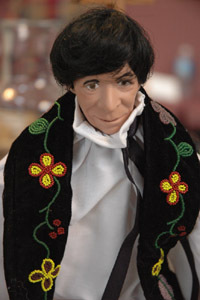 This handmade doll depicting Enmegahbowh was on display in 2007 at the Native American Ministries Winter Talk Conference held in Jamestown, Virginia, to mark the 400th Anniversary of Jamestown. Please take note that the stole he’s wearing is identical to the one in the icon displayed during the Saintly 16 round. Excellent attention to detail, Dollmaker! Are we surprised by a sad lack of cheesy saint crap? No! John Johnson Enmegahbowh was a serious man serving his people and his Church during a very serious era of the American experiment. It’s not surprising that his kitsch-factor is low. However, that’s not to say he wasn’t a funny guy. So, in lieu of sufficient kitsch, here are a couple of stories: In 1874 Enmegahbowh wrote with stunning poignance to the Office of the Indian Commission at 30 Bible House in New York to report the death of his great friend and fellow Christian, Chief Nabunashkong, aka, Isaac H. Tuttle. Then there’s another story that tells of the feistiness of his wife, Biwabiko-gizig-okwe or Iron Sky Woman, (or Charlotte, if you must). It also indicates a measure of Enmegahbowh’s humanity, if not his good humor, and offers a fuller explanation about why he and Methodists at Fond du Lac parted company early in his ministry. The “Man Who Stood Before His People” also stood by his wife. Fair play to him! The story goes that in 1849 Iron Sky Woman and a fur trader got into an argument. And finally, if you need a button to sport on your General Convention nametag, how about this? Unfortunately they only come in packs of 100. The Supreme Executive Committee subtracted 80 votes from Enmegahbowh at 12:33 a.m. EDT, because of voting irregularity we discovered. The person(s) involved have been blocked from Lent Madness. Remember, we encourage you to spread the word about your favorite saints. However, voting 50+ times from one computer is not allowed. 73 Comments to "Margaret of Scotland vs. Enmegahbowh"
Little ol’ Cetlic me has go with the Scottish lass (even though I know she wasn’t Scottish). Now this one is a hard one, and I won’t allow kitsch, or the lack thereof, to influence my vote. But I gotta go with the missionary who went where God called … Go, Enmegahbowh! That’s a great idea, Penny. Send me all my Holy Week sermons and I’ll get right to work on that.
. . . Scottish border clan descendent voting for John. I’m an admirer of both, and the coloring page had me (6 grandchildren, you know). However, my holy habit this week has been to vote for the underdog (the one with the least amount of kitsch). Go, Emmagabowh (it’s also a vote for his spouse–just like any election). I am not sure at this point if I am voting for Enmegahbowh or his wife. Now there is a woman you do not want to cross! I love the image of Enmegahbowh defending his wife’s honor. I especially love the image of him holding the man down while Biwabiko-gizig-okwe beat her oppressor to a pulp. That wouldn’t work today, but oh, my, what a great idea. Go Enmegahbowh! While I know that Enmegahbowh is the one featured in this contest, perhaps some of you who have been following along are curious to see what Iron Sky Woman looked like. (I figured out a long time ago growing up in the Christian & Missionary Alliance denomination that there is no such thing as a Missionary Wife. If you’re out on the field, you’re a missionary…whether you’re the ordained one or not.) Anyhoo, here’s a link to a copyright protected image of our spirited sister http://www.inhonorofthepeople.org/people/enmegahbowh-one-who-stands-his-people-rev-john-johnson . Scroll to the thumbnail of her below the big photo. Here’s one other thing that’s just too wonderful not to share. Yesterday I ran across the name of one of the native deacons mentored by Enmegahbowh. His Anglo name was Mark Hart, but his native name was Obimweweiash which translates to “Sailing Along with a Thundering Cloud.” It’s a name that takes my breath away. Thanks for adding this – wow, what a woman! And there had to be so many more like her about whom we’ll never know. I appreciate learning about her. Yes, indeed. She looks to be a woman who could get the job – not matter what – done. It’s a very close “battle” right now, but, as much as I admire Enm. . . . . (I can’t even say it; I’m surely not going to try to spell it! ), I’m going with the (sort of) Celtic queen whose hospitality to the poor gave us a saintly model. As much as I love kitsch, that alone won’t affect my final decision. Nor will my inability to prononce “E”‘s name right off the bat without having to look at it and syllabize, a practice others could easily acquire with very little effort. Please note that I am not descending to the level of singling out and naming others who make choices based on such. “E” all the way ! And for what it’s worth, I just call him” Enmeggie” and his fearless madam “She who beats the living tar out of those who lack the proper respect for a clergy wife”. Oh, this is too hard! Margaret, whose hands outstretched to serve I see in the stained glass window at my church every Sunday, or tough and faithful Enmegahbowh (and his feisty spouse)? Decisions, decisions–I might just have to get back to actual work while I ponder this fateful choice. This is really getting difficult. On one hand, Margaret, a true blood relative, who was generous to a fault to her people and spiritual; a nun of the heart if not of the body. Then “E”, a native American and a deacon, something we share. Tough call, especially if we ignore gender (doesn’t God?). This time, I’ll go with and his wonderful wife. Had to go with Margaret because I just ordered those lovely coasters! I cannot vote for Margaret because I am still mad that she ousted John Cassian, my favorite saint. So few voted during that round – don’t people know who John Cassian was – have they not read his writings? As a deacon, sometime klutz, and promoter of outdoor worship settings, I’m intrigued by Margaret’s book of Gospels that didn’t show any water damage after being dropped into a river. If anyone offers those for sale, they have a buyer! Torn between Margaret and Enmegahbowh…off to ponder. As the daughter of a feisty woman and a strong man who stood by her (George & Jo Scholz) my vote goes to Enmegahbowh (and Iron Sky Woman). I think a product line to go with Holy Women, Holy Men is in order. With the name of Peggy I had to vote for Margaret. Margaret of Scotland used her influence over her husband to force Roman ways on the native church. Her sons continued the “Romanization” during their reigns. Those who refused to convert risked being subjected to the royal power of investiture where their lands would be seized and turned over to the church. Years and years ago one of Margaret’s sons took my ancestors land when they refused to convert. I cannot vote for her. I also have a wife with Native-Ameican blood who at times has shown some of the traits of Iron Sky Woman so a vote for the home team seems like a good idea. AS WE MOVE TOWARD THE GOAL, COMMENTARY SEEMS TO HAVE BECOME WILDER AND MORE UNDISCIPLINED AND HAS DETERIORATED INTO VARIOUS SALES PITCHES REFLECTING KITSCH, WHATEVER THAT IS BUT WHICH SOMEONE RENDERED AS “KRANK” WHICH I THINK IN GERMAN TRANSLATES AS “SICK??????”. OF COURSE I AM MISTAKEN. Sam Portero’s message (in Brightest and Best) about Emmegahbowh was inciteful enough to sway my vote. OK! NO NEED TO SHOUT! Margaret was not a Scot; she a Saxon princess born in Hungary, who married a Scottish king. She did not speak Gaelic and refused to learn it, insisting that that the court language become English. She detested the native Celtic Church, in favor of Rome. She forced many of the native clergy out of the church and replaced them with English clergy. The Roman diocesan structure replaced the native Celtic one. As a descendant of Gaelic Highlanders, I don’t like her. Enmegahbowh was part of the 99%, not the 1%. His power was not the power of force but the power of persuasion and living a worthy life. 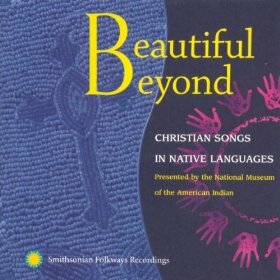 His work continues in the work of the Native American churches in northern Minnesota. his wife gave him “a sound beating” certainly is the power of force and a bad witness at that. I couldn’t see the Margaret peg doll’s Tartan sash, to determine which of the Clans has been associated with her, and that makes me wary. Thus, even though I have a LOT more Margarets in my family tree than Enmegahbowhs or Iron Sky Women, I’ll have to cast my lot with our native son. Tough call, but I have to go with Maggie over Enmegahbowh. Firsts are nice and it is good that he brought Christianity to the Native Americans, but the Scots were pretty notoriously uncivilized too. Without Margaret, ultimately, there would be no Presbyterians. Jennifer, thanks for the link to crapatmyparentshouse. Totally Hilarious. Good model for the future churchy kitsch blog, I think! Thank you Dr. Primrose, you said it for me!!! Anyway, GO MINNESOTA!! Go E, many thanks for enlightening natives and welcoming them to a glorious heaven! Both E and Margaret are worthy competitors, but neither one can win against the awesome Mary Magdalene in the Faithful Four! Oh and for tomorrow, don’t let the YouTube smear campaign sway you – VOTE EMMA!!! During the last century in America the white man found the native peoples to be notoriously uncivilized. In an effort to civilize them the white man removed them from their lands and stripped them of their native ways and livelihoods. The same thing happened to the native Celts in Scotland as first Margaret and later her sons stripped the Celts of lands and livelihoods in order to civilize them. I think that we would all agree that using means such as these to force beliefs on another people is wrong and actually a bit unsaintly. For anyone moved to vote for Margaret merely because of Scottish affiliation, hold off. She wasn’t just a lovely do-gooder. She was also an aggressive advocate for the subjugation of Gaelic language and culture and she would have happily done away with the Celtic Church as a whole. Now, I know the distinct features of Celtic Christianity are a matter of great scholarly dispute, but I still say Margaret was an ungracious imperialist. Well, actually Jim and I have been beating that drum all day! Thanks for your support! Ceud mile taing! Gaidhlig gu brath! Dude…..in english please? not too many of us speak gaelic….. The choices are not going to get easier as we get closer to the Golden Halo. Today’s matchup was another difficult one. For me, since Enmegahbowh had little kitsch and more explanation, the explanation swayed my vote. Anyone who trained more deacons has my vote. 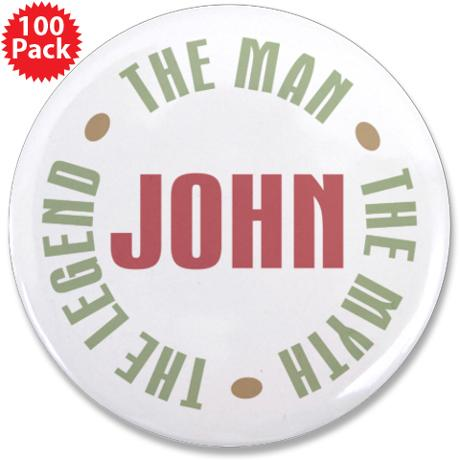 Go, John, Go! Anyone who “barbers” has my vote! To kitch or not to kitch–that is the question–today I’ll go for the kitchless big E–and, of course, his better half! oops–can’t spell today–it’s kathi–too much lenten discipline at the gym! Jim and dr.primrose have swayed me. GO DEACONS !!!!!! Very easy to pronounce. However his name is difficult to spell correctly. It’s about 4 pm and the difference in votes is three. A real nail biter! After the hearty laugh reading about Emmagabowh and the scolding I’d be sure to get from my sister and BIL in Minnesotta, if I did not vote for hi I voted for him. Do like Margaret though. Hard choice. Okay: with a Scottish maiden name (Baillie, admittedly Lowlanders), one might think that I would choose Margaret…but I am going with Enmegabowh. Admire them both, but have to choose someone who made a huge leap of faith to become part of God’s new work in this country among the people of the First Nations. 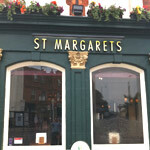 A word to the Kitsch-meisters: I’m not convinced that the two stained glass depictions of Margaret are in fact depictions of She the Scottish Queen. 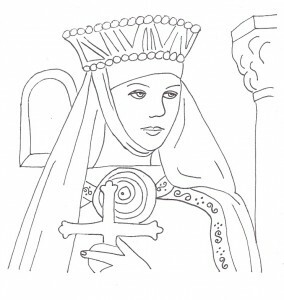 The peg doll, the felt doll, and the coloring page all show her with some sort of crown, while the first stained glass image depicts a woman with a palm branch, traditionally associated with martyrdom — and that would fit Saint Margaret of Antioch (patroness of the Society of Saint Margaret). The second stained glass image depicts someone with a semi-pre-Raphaelite coiffure…maybe the headband is meant to depict a diadem or tiara-type thing, but as I say, not nearly as convincing as the headgear on the first three images. Anyone for fascinators? You could do the kitsch blog in time for Pentecost, under the heading “Stuff that really ought to be burned…”. I’d have to vote NO on a fascinator…since the last Royal Wedding, those have been ruined for me. But I think I’ll be casting a vote for the Native American missionary and his missionary wife. The lack of kitsch may have been a determining factor…not gonna lie. Skye gets the family vote tonight and she went for the Iron Sky(e) Woman’s husband. God spoke her real name. Enmegahbowh doll looks a lot like F. Murray Abraham… go Team Margaret~! What a nail biter… is there instant replay to show over night (eastern time) lead changes ? How can you not vote for E… that charming doll that looks eerily like Dr. Spock with out the ears!!! 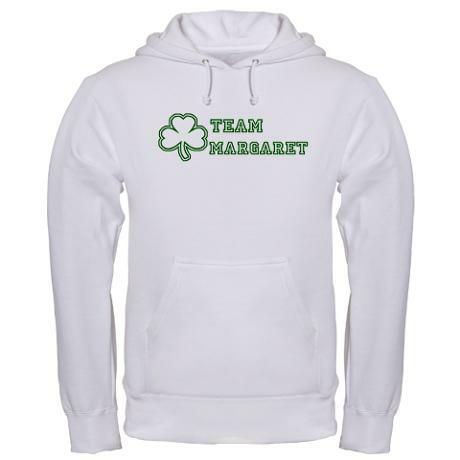 Wish there were more than 1 so I could order one!!! linda…..are you sure you don’t mean MR. Spock as opposed to DR. Spock? For Minnesota! For the Episcopal Church! For Enmegahbowh (en-muh-GAH-bo)! There was a surge of 50+ votes just before I posted the notice. When I noticed that, I found another of about 30 from earlier. Voting for E. “Local Boy Does Good!” Headline news. ballot stuffers again. How disappointing. Enmegabowh had been winning, now he’s done. This worthy man did not deserve such dishonesty, even in our little game. Also disappointed by the ballot stuffing – it’s not as if this is the Mega Millions jackpot. I have to say I’m really impressed by that Enmegahbowh doll…. Also really disappointed that someone cheated. How could you! We’re talking about Saints here! (and I was rooting for Enmegahbowh). Sigh. This gets problematic for me because I love the Celtic Spirituality. I however was Confirmed in St. Margaret of Scotland, so I guess sentiment wins out here.